Exceptional location on the ground floor private garden, magnificent 180 ° sea overlooking a creek in a marine reserve. Very bright and spacious 135m² apartment, including one large space 45m² of living, one en suite master bedroom, 25m² terrace where lunch and dinner not overlooked by the sea, located 5 minutes from the beach and 600m from the port and its traders. To go to the sea, no streets to cross, no need to use a car, you can go and quickly come to the beach to the apartment in swimsuit with just a towel. New bedding good quality (linen provided extra), kitchen. Barbecue, deck chairs, parasol available. Hiking in the creeks and pine forests 10 minutes walk. Hiking and natural mountain biking hill 10 minutes. sailing club, kayak and paddle at 3km. 1 restaurant 500 meters and several in the city center and the port of Carry. Casino games and cinema in the town center 1km. Amusement park at 7 km. Marseille 25 kms. Aix en Provence at 28 kms. Camargue and Les Baux de Provence at 50 kms. Exceptional nice holiday property: ground floor and private garden with a wide paved terrace ideal for alfresco dining, and a magnificent 180 degree view above the sea, overlooking a creek in a marine reserve. To reach the beach no street to cross, no need to Log use a car, you can come and go Quickly from the beach to the apartment in just a swimsuit with a towel. Private closed residence with a garden bordered by a fence. New good quality bedding (linen not provided), full kitchen. Hiking and mountain bike trails in natural hill in 10 minutes. Scuba diving center, sailing club and Kayak 1km. Restaurants: 500 m and more down town in front of the harbor of Belgium Bosnia Carry qui good value restaurants with seafood, oysters. Lovely walks along the sea. 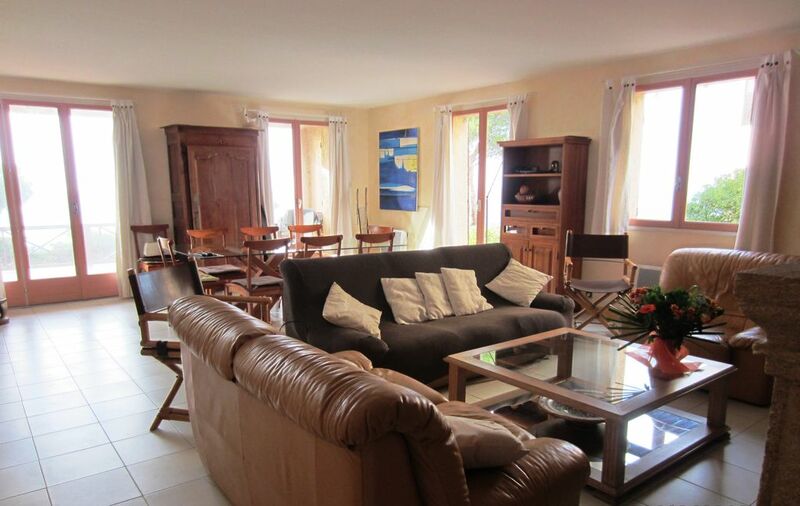 We stayed at the Carry-le-Rouet apartment for 10 nights and had a wonderful experience there. The description and photos on Homeaway do not do justice to how spacious and comfortable the apartment really is. The backyard was especially wonderful. We ate breakfast and dinner out on the patio every day, admired the magnificent view, listened to the cicadas, and just lounged around enjoying the beautiful weather. The apartment is within walking distance (under 15 minutes) to everything - the beach (Cap Rousset), restaurants, bakeries, supermarkets, banks, etc. The train station is about a 20 minute walk if you want to make a day trip to Marseille. You get one assigned parking spot, but the ability to park a second vehicle in the complex’s visitor parking was a blessing as parking in town can be horrendous. Located close to the major highways, the apartment is an easy drive (30 min to 1.5 hours without traffic) to Aix-en-Provence, the hill towns of the Luberon, the Alpilles area, Arles, Avignon, Orange, Nimes, the Camargue, Cassis, and Marseille. There aren't any wineries in the immediate vicinity, but the Rhone Valley and the Coteaux d'Aix are both relatively close, as is Bandol. Lavender country is also about 1 to 1.5 hours away. We caught the beginning of the bloom and it was magnificent. Mont Ventoux, Nice, and Cannes are a bit farther away (~2 hours without traffic), but they are doable. Carry has a small, but pleasant farmers’ market on Tuesday and Friday mornings, so it’s a nice place to stock up on fresh fruits, vegetables, cheese, etc. The kitchen is well stocked, so if you don’t want to eat out, preparing food at home is definitely an option. We did so a few times. Booking and check-in and check-out all went very smoothly as the owners are very attentive and respond to emails very quickly. When you get there, a man who lives in the apartment complex will greet you to open the gates and let you into the apartment. You get two sets of keys which is very convenient with a large group. Overall, it was one of the best places we’ve rented. Wir haben eine sehr erholsame Woche in der Ferienwohnung verbracht. Die Wohnung ist groß und hell. Wir haben es genossen, morgens mit Meerblick zu frühstücken und konnten uns sogar trotz Mistral in der Mittagszeit auf die windgeschützte Terrasse setzen und uns sonnen. Die Lage der Wohnung ist noch schöner als auf den Fotos erkennbar. Hinter dem kleinen Garten gibt es einen Aussichtspunkt mit Blick über die Bucht von Marseille. Die Terrasse erstreckt sich über die ganze Hausfront, ausreichend Platz zum Sitzen, Essen, Sonnen, Spielen. Drei Schlafräume sind eher klein, aber mit reichlich Stauraum ausgestattet, das vierte sehr geräumig. Die Betten haben einen sehr guten Schlafkomfort. Küche und Wohnzimmer sind groß und mit allem ausgestattet, was man benötigt. Alles in allem ideal für eine Familie mit drei erwachsenen Kindern und deren Partner/Freunde. Die Betreuung vor Ort sehr freundlich und unkompliziert. Wir haben uns dort sehr wohl gefühlt. Vielen Dank! Nous avons passé un très bon séjour dans cette location propre, spacieuse et agréable. La vue sur la mer est très appréciable et, en mars, nous avons pu manger à l'extérieur. Nous recommandons cette location. Wir haben hier einen tollen Urlaub verbracht und würden jederzeit wieder kommen. Die Ferienwohnung bietet viel Platz drinnen und draussen. Der Garten mit den duftenden Pinien, den singenden Zikaden und dem Blick aufs Meer ist traumhaft schön. Ein idealer Platz um auszuspannen und den Alltag hinter sich zu lassen. Die Zimmer sind einfach und schön eingerichtet, mehrere Wandschränke sind vorhanden. Das Wohnzimmer ist sehr gross und geschmackvoll eingerichtet. Praktisch ist auch die vorhandene Waschmaschine. Nous avons passé une semaine à nous régaler à la fois de la situation du site et du confort de l'appartement avec une belle terrasse dans la pinède et face à la mer. L'accès rapide, à pied, au port et à la calanque du Cap Rousset n'est pas négligeable ainsi que la proximité de jolies ballades. L' accueil et la disponibilité ont été fort sympathiques , ajoutant à la difficulté de rendre les lieux, sans nostalgie, en fin de séjour!!! Nous sommes heureux que votre séjour ait été des plus agréable et que vous ayez apprécié ce logement que nous avons voulu le plus accueillant et confortable possible. Espérant vous recevoir à nouveau. Toutes les vacances scolaires hors période d'été sont à 1000 € / semaine Votre animal de compagnie sera le bienvenu sous condition. Assurance responsabilité civile obligatoire. A demander à votre assurance habitation, qui vous la délivre gratuitement.